Is it a car? Is it a bike? Does it matter? "Don't worry about if it's a car or bike. Worry about having fun." This simple piece of advice comes from Kevin Reilly, the VP of Motorcycle Marketing for Polaris. It's immediately clear that he wants to avoid comparisons to vehicles with two or four wheels. At the moment, I don't mind, because I've just been given the key to a unique recreational vehicle and been given permission to flog it. But what am I supposed to compare it to? 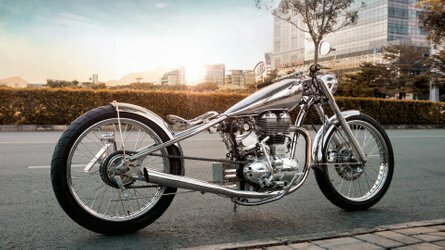 There's no true standard for what a modern three-wheeler is, and that makes it confusing for consumers and legislators. 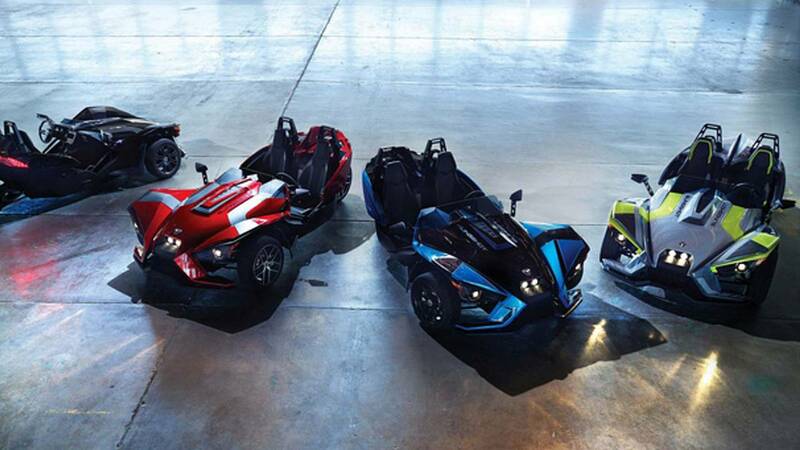 Some products (like the Can-Am Spyder) resemble a motorcycle, while others (like the Campagna T-Rex, Morgan three-wheeler, or Vanderhall Venice) look like cars that suffered an amputation. Depending on your state of residence, this is either an automobile, a motorcycle, or an autocycle. 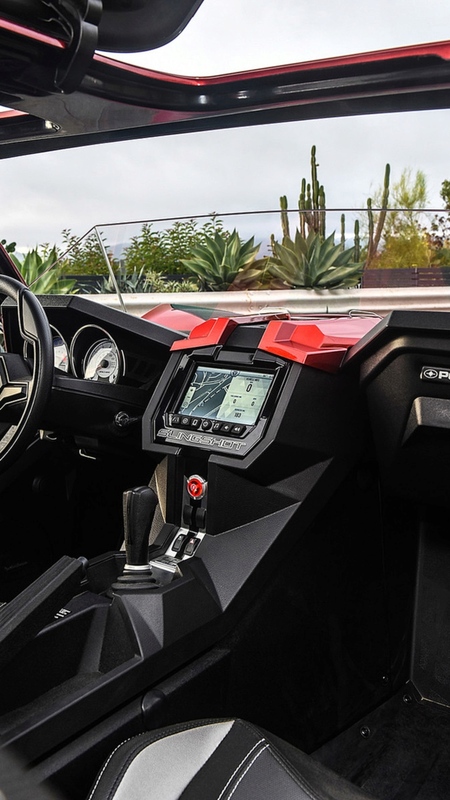 In 2014, Polaris attempted to define the market with the Slingshot, and they believed they could create a new type of recreational vehicle. They have a history with this kind of thing: in the 50s, a few people had different ideas on what a snowmobile could be, but the first modern recreational snowmobile was arguably the Sno-Traveler, developed by Polaris Industries. 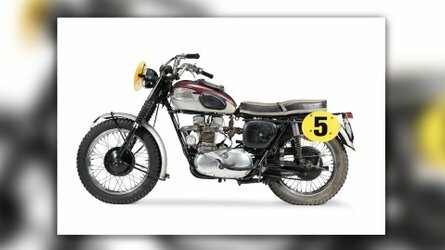 Playing in the snow is one thing, but getting passionate car and bike fans to add a three-wheeler to the stable is a much bigger challenge. 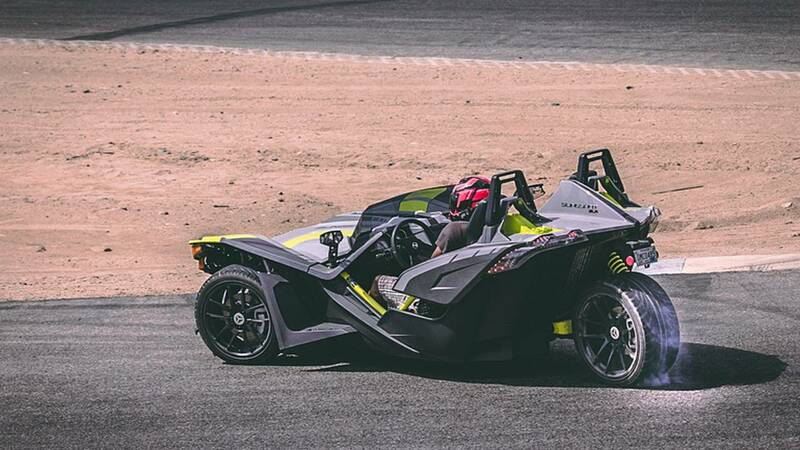 Polaris recognizes this, and has responded with a 400-percent increase in its product development budget for the Slingshot over the last two years in an attempt to grow the three-wheeler market. I think the company's got its work cut out for it, but David won his famous battle against Goliath as an underdog with a slingshot, so who knows? I understand if you look at this and immediately get upset that it's not really a motorcycle, but you might be missing the point. Back to Kevin's concern: is it fun? The answer to that is a wholehearted "yes." If you buy a Slingshot, that's the number one question you'll get from other drivers and pedestrians. Some 40 states consider this an "autocycle," which means it feels like a car but it doesn't have to meet automotive safety standards. It also means that in those states, you do not need a motorcycle endorsement on your license. Ten states (including my home state of California) consider it a motorcycle, so I'm legally required to wear a helmet while I ride drive it. 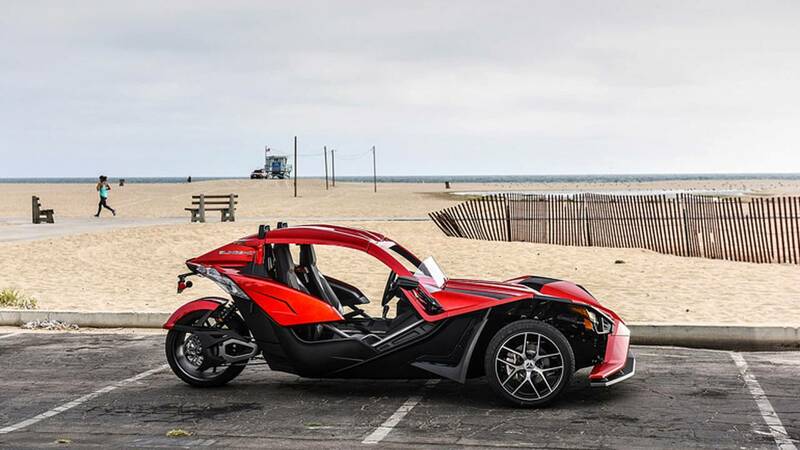 Polaris introduced the new lineup of Slingshots to a group of motorcycle and automotive journalists in Venice, California. In general, the car guys saw figures like 173 horsepower and 1749 lbs of wet weight and thought it had a good power to weight ratio. Bike guys saw it differently. But when Polaris looks at its two main customer types, it doesn't see car or bike fanatics; it sees "adrenaline junkies" and "attention junkies." The former enjoy driving at the limit of adhesion provided by the meaty rear wheel, while the latter would rather put their time into customization and show off their work while driving slowly (I was surprised and impressed by the quantity and quality of custom Slingshots I saw in Daytona this year – CC). 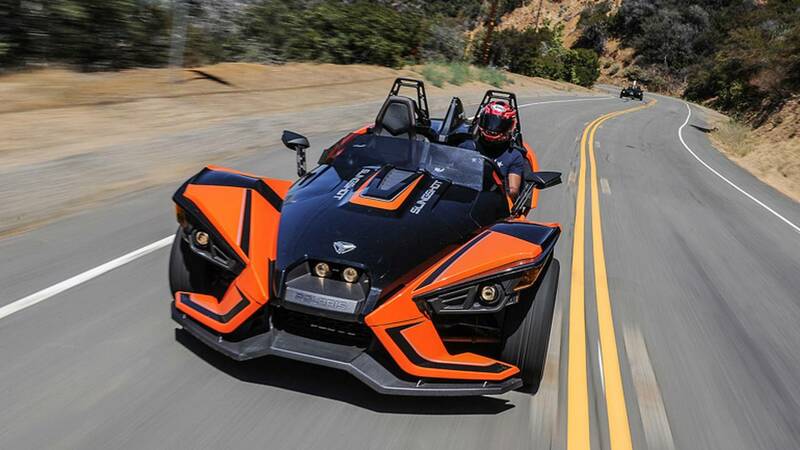 In total, both groups have bought approximately 20,000 units since the Slingshot was released three years ago and Polaris is making a big push to attract more individuals from both categories. On the flip side, there are multiple websites like Slingshot Only, SlingMods, or the straight-from-the-'90s Pimp My Slingshot that are full of customization options ranging from $20 lug nut covers to $2,000 big brake conversions, and even a $16,000 4-seat conversion. 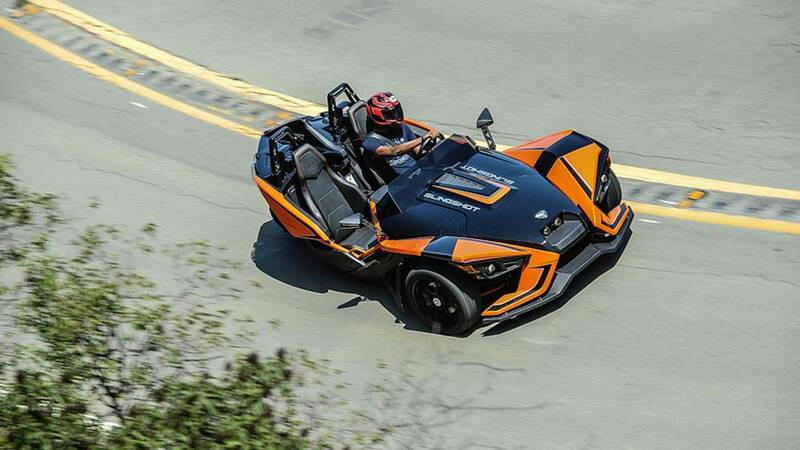 Slingshot owners are very passionate about their vehicles, and many of them spend a lot of money to personalize them. S: US $19,999/Gloss Black - the base model has been discounted by $2,000 compared to last year. Features include 17-inch front/18-inch rear wheels, projector beam headlights, LED taillights, and an electronics package with stability control, traction control, and ABS. Polaris gets my appreciation for making the first two very easy to turn off independent of each other, and I don't mind that ABS has to always stay on. SL: $25,499/Navy Blue or Sunset Red - upgrades over the S include Ride Command, a back-up camera, 100W Rockford Fosgate audio system, windshield, a more elaborate paint scheme, and 18-inch front/20-inch rear wheels. SLR: $28,999/Electric Blue - upgrades over the SL include turn-by-turn navigation for the Ride Command, a 305mm-wide rear tire, two-piece composite brake rotors, bolstered sport seats, and Sparco controls (steering wheel, pedal covers, and shift knob). SLR LE: $30,999/Ghost Gray w/ Lime-Squeeze accents - upgrades over the SLR include Bilstein 10-way adjustable suspension, 200W Rockford Fosgate audio system, a limited edition paint job and color-matched seats. 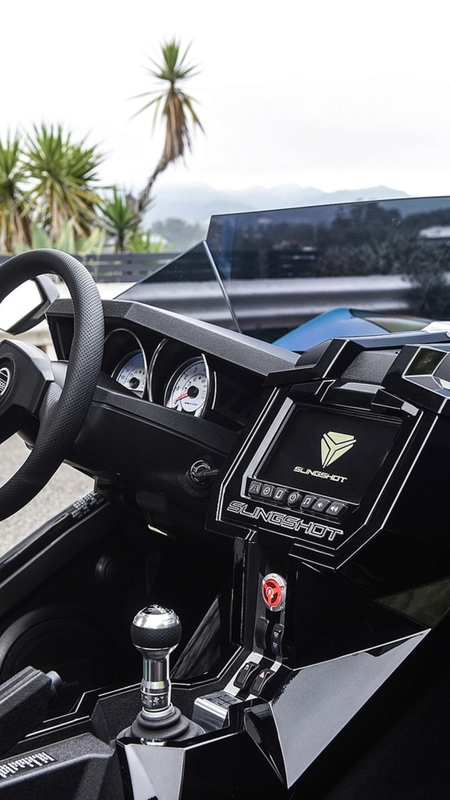 If you've driven a Slingshot before, the most notable upgrade this year may just be the addition of Ride Command, a 7-inch infotainment touch-screen system that will look familiar to those of you that have ridden an Indian dresser like the Roadmaster. It works very well, and it is a huge upgrade over last year's system which was much smaller and only handled audio. Ride Command is optional on the base model and is standard on the rest. Turn-by-turn navigation functionality is only standard on the SLR and SLR LE. Ride Command also displays customizable views which include vehicle and trip information like engine hours, trip meters, altitude, fuel economy, and more. Bluetooth integration allows you to pair with your phone to listen to music or identify an incoming call. The GM-sourced drivetrain in the 2018 lineup remains the same - a 2.4 Ecotec inline four that used to power the Pontiac Solstice and Saturn Sky convertibles. The all-aluminum motor produces 173 hp at 6,200 rpm and 166 lb-ft of torque at 4,700 rpm, and it's thankfully paired with a 5-speed manual transmission. 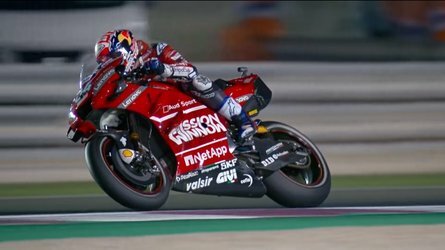 The power might not seem like much if you ride a modern superbike, but it's enough to easily overwhelm the wide rear tire and get sideways if you desire. Well, once you've turned off the electronic nannies with a switch on the dashboard at any rate. I'm not Juan Pablo Montaya, but I can have almost as much fun as he does on the track. Photo by Nathan May. It's a big, loud go-kart. I know that, "Handles like a go-kart" is an overused phrase in car reviews to describe small, nimble vehicles like a R53 Mini Cooper, Mazda Miata, or Lotus Elise, but I'm not commenting on the handling. It really just feels like you're in a go-kart that got enlarged in a photocopier. Being low to the ground makes you feel like you're going faster than you are, but the barrage of wind will let you know when you're going too fast. The open cockpit is reminiscent of motorcycling in that you can feel temperature changes, smell nearby scents, and hear the drivetrain at work. It can be an intense experience for your senses, for better or worse. I truly enjoyed feeling the wind envelop me, but the whine of the of the right angle drive gears while coasting or decelerating is quite obnoxious and there isn't much in the way of sound deadening to hide it. It's so reminiscent of a go-kart that I ended up taking it on a kart track! Photo by Nathan May. Back in the real world, the layout of the wheels means it can be difficult to avoid bumps since the rear wheel will typically run over the potholes you avoid in between the front wheels. The best advice I got was to line up road imperfections with the driver's seat, which was usually sufficient to thread the needle between the left front wheel and the single rear wheel. The good news is, the adjustable – rebound, damping, and preload – Bilstein shocks on the SLR LE model are reasonably compliant. Minor bumps won't pose a problem, but you'll definitely feel hard shots to the rear wheel. 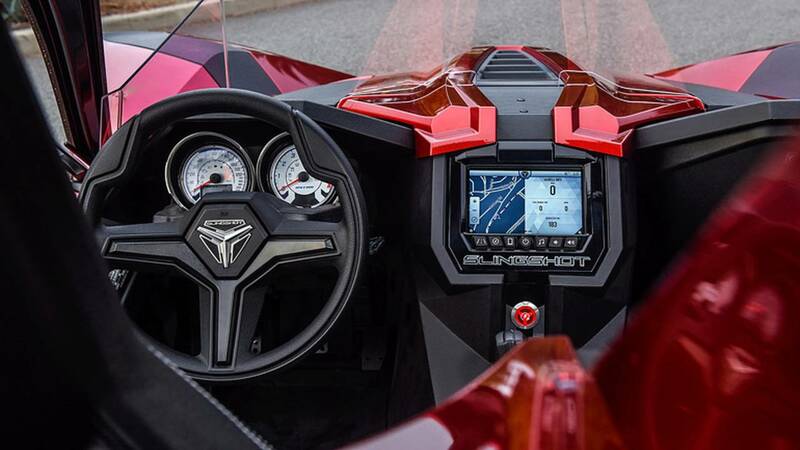 Where the Slingshot loses some points is with the steering. The base model steering wheel has a sub-optimal tactile feel to it, especially the flexible protrusions at 10-and-2. I highly recommend that you spend a little extra for the Sparco steering wheel and shift knob, which feel just right and will tremendously increase your driving pleasure. The steering is electrically assisted, and I found it to be over-boosted on initial turn-in, which means you'll constantly have to feed in minor corrections as you go around long sweepers. In fact, everything about the controls feels a little bit twitchy (some of you may enjoy that), except the brakes. They work well enough but have less initial bite than I expected. Unless you're pushing it, you won't really notice that there's just one wheel behind you. On brisk 1st-2nd gear shifts you may occasionally get the rear tire to break loose and it will slide towards the right for just a moment. 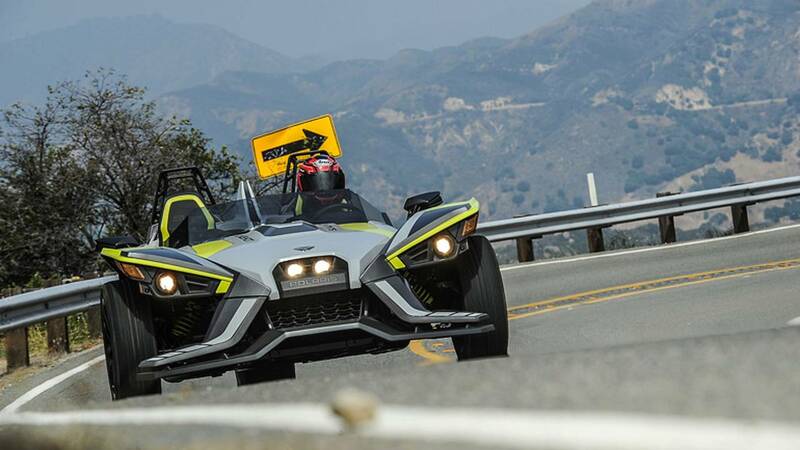 If you like unique driving experiences, the Slingshot should be high up on your list. It won't matter if you're shy though, as you can only drive this if you enjoy random people stopping you and asking questions or taking photos as you drive alongside them. You'll be making it into a lot of social media feeds, whether you like it or not. Wearing a helmet while you're moving on backroads is fine and you may even find that it adds to the sensation if you feel like being Mr. Racecar Driver. But it feels (and looks) a little goofy to be wearing a helmet when you're stopped in rush hour traffic on the 405 freeway. Over the years, the No. 1 request from Slingshot customers has been for some respite from the sun. 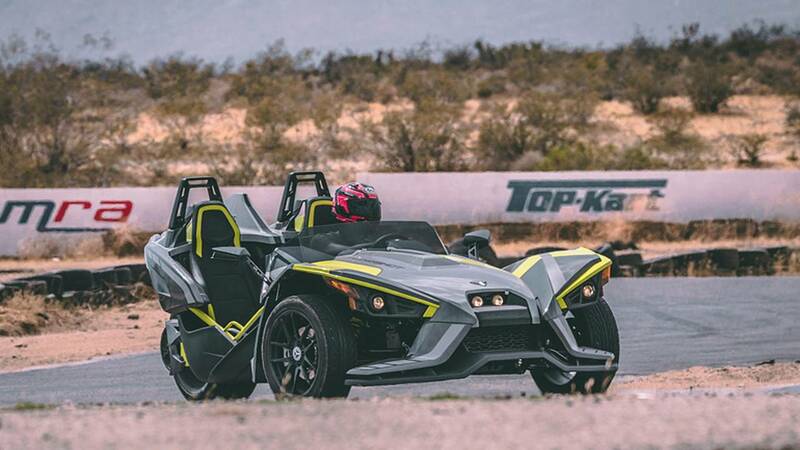 Polaris recently responded with the creation of the Slingshade (Some folks call it a Slingshade; I call it a Kaiser shade. Mmmm – CC), their fancy name for a roof. 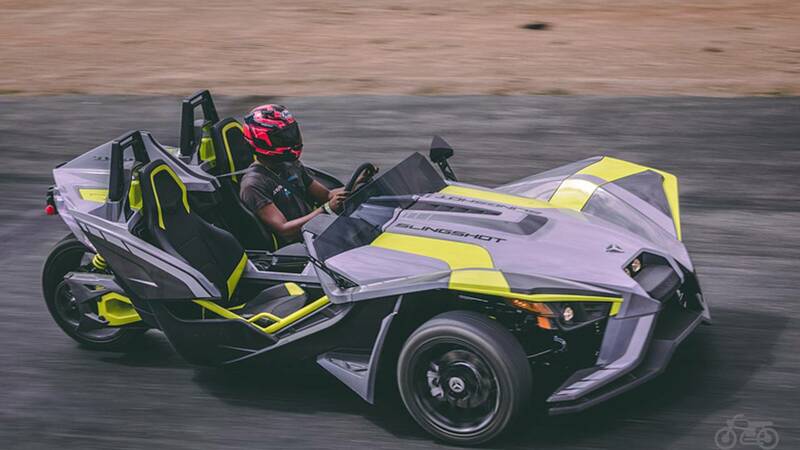 I wasn't able to get any seat time with a Slingshade-equipped model to see how it felt, but I could tell by watching others that tall individuals may have some issues with headroom in states that require Slingshot drivers and passengers to wear helmets. There's a small glove box in the usual location, and lockable compartments behind each seat that are just big enough to swallow a helmet. 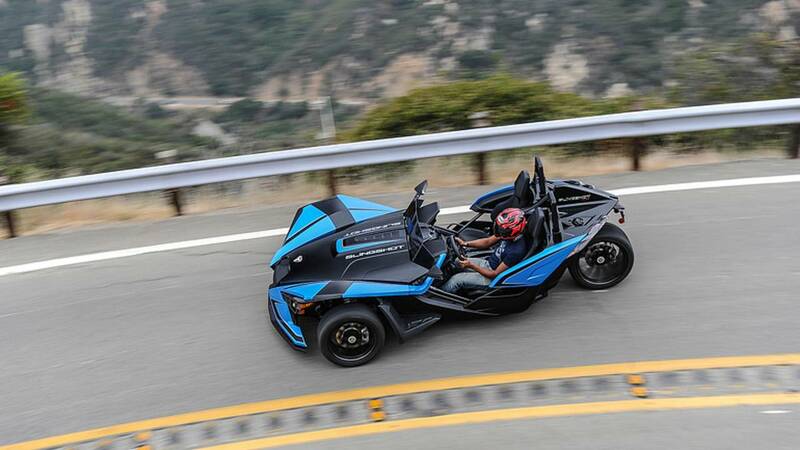 All told, the Slingshot offers 99.2 liters of storage. That's enough if you just want to go for a Sunday drive, but you're going to have to pack like you're on a motorcycle if you want to take a weekend trip with a passenger. For comparison, the OEM Vario luggage – two sidebags and top case – on a BMW R 1200 GS will fit 103 liters. The previously discussed Ride Command is an excellent addition, but beyond that there isn't much else in the way of creature comforts. One switch in the center console allows you to turn off the traction and stability controls, while another turns on ambient lighting in the foot wells in two color options, white or a blue that matches the color of the gauges when they're lit up at night. The interior plastics feel a bit cheap, but Polaris deserves some leeway because everything is waterproof. A bigger concern was that the horn of my loaner did not work. When your friends see you in this, they're going to want you to take them for a spin, and it will probably be unlike anything else they've ever ridden in. It's generally pleasant, but the exhaust is routed underneath the passenger footwell so if it's a warm day or your passenger has been in the vehicle for some time, their legs may get uncomfortably hot. It's been a well documented issue on Slingshot forums for years, and while some changes were recently made to address the issue, they weren't enough. A buddy of mine joined me for a ride in 90+ degree weather, and it got so hot he tried to use a windshield sun shade as insulation for temporary relief. Sure, those are designed more for sunlight than heat, but desperate times call for desperate measures. 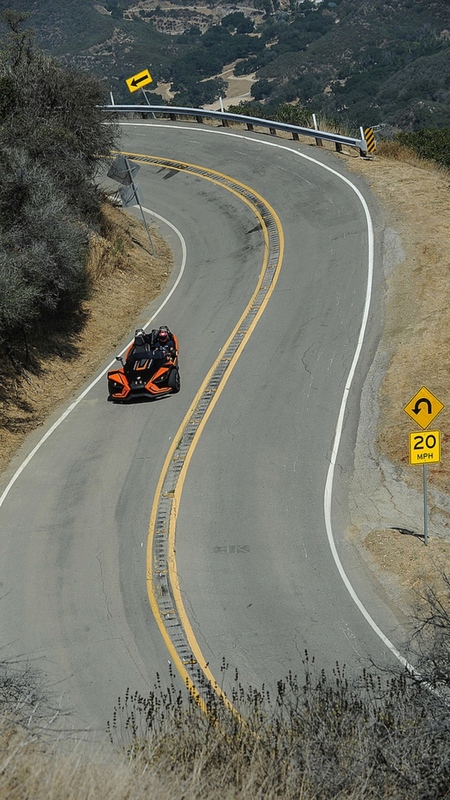 During the launch, Polaris organized a route through some of my favorite roads in the Santa Monica mountains, and the Slingshot was an absolute joy to take down the curves of Latigo Canyon. It was even more fun on the kart track at Grange Motor Circuit. When I was stuck in traffic on the way home in LA city streets though, I was frustrated that I wasn't splitting lanes on a real motorcycle. 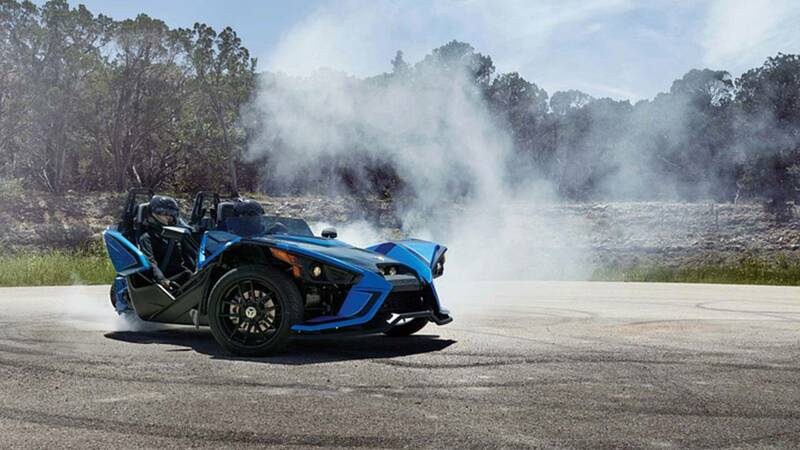 As a tool for driving joy, the Slingshot is fun and dynamic. If you're on this site in the first place, however, then you're probably who Polaris would consider an adrenaline junkie and I'd wager you'd have more fun on two wheels. Where I do get to make a bold claim is with the attention junkies. 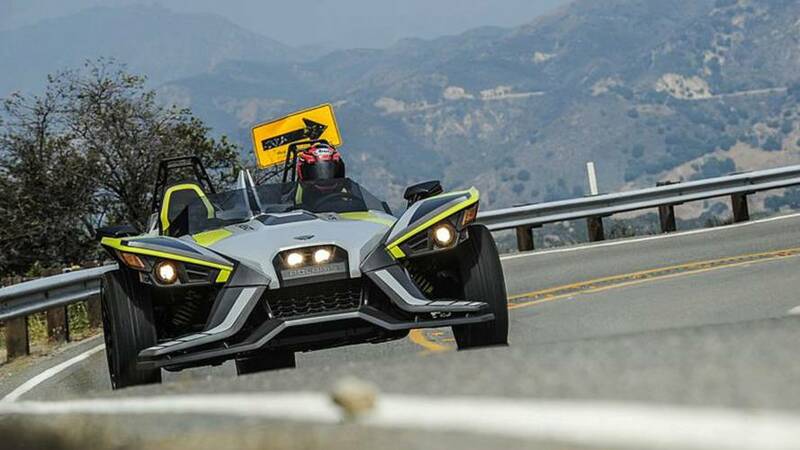 I've never driven anything that gets as much attention as a Polaris Slingshot, and the former owner of that title used to be a Morgan 3 Wheeler. If I'm on a special bike, most people in cars don't notice. In the Slingshot, everybody notices. If you crave attention on the road, this is the best $20,000-$30,000 you can spend. Pedestrians at crosswalks stop and ask you questions, kids will go wide-eyed and wave at you, and fellow motorists in cars worth four times as much will start pulling out their phones and recording you. This will happen every time you go out for a drive, and it can be exhilarating or exhausting depending on your personality. I fall into the latter camp, but if you like being the star of the show, I don't think you can go wrong with this oddball from Polaris. 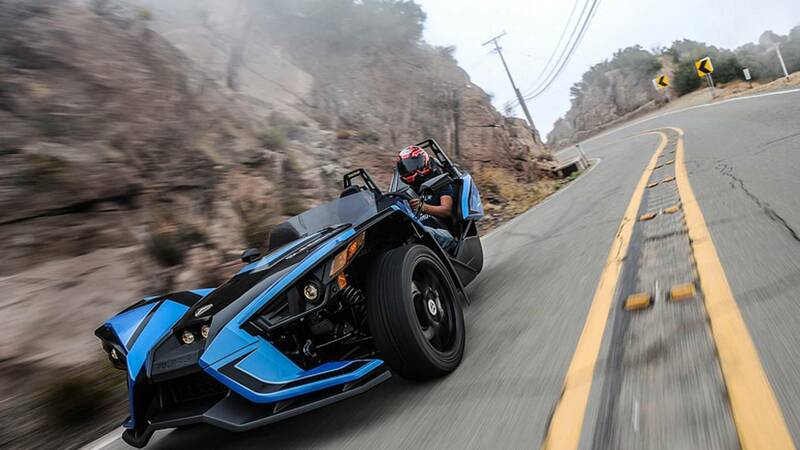 I started off by saying that no matter whether you call it a car or a bike, the Slingshot truly is fun. I think it's basically a car, which means it's time for the caveat: it's very exciting for a car, but it's still a car and that means it's just not as much fun as a motorcycle. This might not be a stunning admission from a passionate motorcyclist, but seeing as we're all together here on RideApart, I do think it's necessary. While this may not be for me, it is definitely a unique way to have fun, and that's what Polaris has been looking to create. 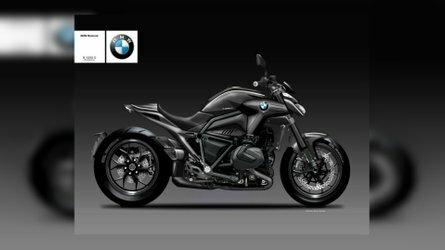 Let's see if they can make 3-wheelers the next toy the public has to have.